Get a great deal on the top selling SVP SmartWatches available today. 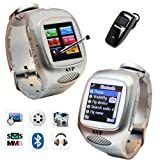 This watch phone is a quad band GSM (850MHz, 900MHz, 1800MHz, 1900MHz) unlocked phone that can be used from anywhere across the world. Stick in a SIM card and you gain instant access to an amazing communication device that works like a cell phone on your wrist. 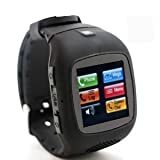 This watch phone is a full multimedia center that features a camera, video player /recorder, and audio player/recorder. 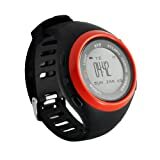 Easily capture photos, video, and audio - all with just the click of a button.This thrifty watch phone also includes a clear and accurate 1.49 inch touch screen LCD display that allows for easy menu navigation and quick dialing without even having to use the included stylus, just use your fingers! SVP introduces new colors for the G13 watch phone series, now with total of six colors to select from : Camouflage, Royal Blue, Olive Green, Pink, Black and Silver. The SVP G13 is an unlocked touch screen watch phone compatible with the GSM quadband network : 850 / 900 / 1800 / 1900 MHz. It features a 1.5 inch touch screen and includes a stylus pen for easier access. Bluetooth is supported and included in the package, along with the charger. The G13 is also a camera phone and records videos, it also plays music and supports up to 32GB of MicroSD card. All packages include: G13, USB cable and wall charger, 1 battery, Bluetooth and charger, and the user manual. 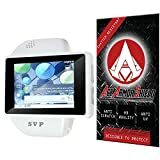 SVP® is exclusively listed by Amazon sellers(slimsharp, Dr. Tech, SVP-TECH). If you found seller ID is not anyone of the three, please report to Amazon immediately, as they are selling counterfeit product. Customers who buy the counterfeit product will also loss the SVP® warranty privileges. 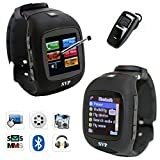 Description: Introducing to the new SVP Product the G14 Cell phone Smart Watch. This is a very cool unlocked phone watch. Talk the time away with this exciting, new watch-phone! Lightweight and compact, this watch-phone will revolutionize how you communicate with family and friends. It is easy to use - simply insert your sim card and start dialing. G14 is an unlocked touch screen watch phone compatible with the GSM quadband network : 850 / 900 / 1800 / 1900 MHz. It features a 1.5 inch touch screen and includes a stylus pen for easier access. Bluetooth is supported and included in the package, along with the charger. The G14 is also a cell phone and it also plays music and supports up to 32GB of MicroSD card. All packages include: G14, USB cable and wall charger, battery, Bluetooth and charger, and the user manual. You'll have everything you need to make all your calls. Take it and wear this cool stylish cell phone watch and HAVE FUN WITH IT!!! SVP introduces new colors for the G13 smart watch phone series, now with total of six colors to select from : Camouflage, Royal Blue, Olive Green, Pink, Black and Silver. The SVP G13 is an unlocked touch screen watch phone compatible with the GSM quadband network : 850 / 900 / 1800 / 1900 MHz. It features a 1.5 inch touch screen and includes a stylus pen for easier access. Bluetooth is supported and included in the package, along with the charger. The G13 is also plays music and supports up to 32GB of MicroSD card. All packages include: G13, USB cable and wall charger, battery, Bluetooth and charger, and the user manual. 1.Time display, HD 1.54 inch touch screen, 240*240 pixel. 2.Smart Bluetooth connect Andriod and IOS. 3.Answer and remind incoming ring directly. 4.Smart remind and Anti-lost. 5.Sync phonebook and SMS. 6.Some functions can not support for Iphone. 7.For Iphone User, this smart watch phone Supports: Answering the phone call. Call back from the Call History. But can not make a phone call from contact book. Can not text message.